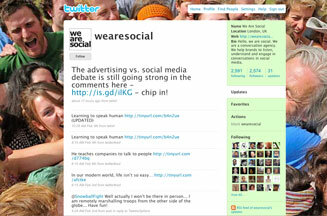 LONDON - Marketers have weighed into the debate over how Twitter should monetise its micro-blogging service. Following Twitter's confirmation in Marketing yesterday that it plans to start charging brands for commercial marketing activities, a debate has emerged over how the service can distinguish between individuals and brand users. The service has gained ground in the UK thanks to celebrity users including Stephen Fry and Jonathan Ross. Some suggest that companies such as Dell and Starbucks, which use the site, would put more emphasis on the individuals tweeting on behalf of the company. Robin Grant, managing director of agency We Are Social, said: ‘The challenge Twitter will face is that there's such a grey line between personal and commercial use. If I spend a lot of my time on Twitter talking about business-related stuff, where does that leave me? Others suggest that, like Facebook, Twitter could sell targeted ads within the stream. But Brendan Mitchell argues that adding ‘an extra layer of services worth paying for is a better approach, as long as it doesn't alienate or lessen the initial free service'. Should brands advertise in Twitter streams?